Loveyatri ( Love travelers ) is a 2018 Bollywood musical romantic drama produced by Salman Khan under Salman Khan Films and directed by debutante Abhiraj Minawala. 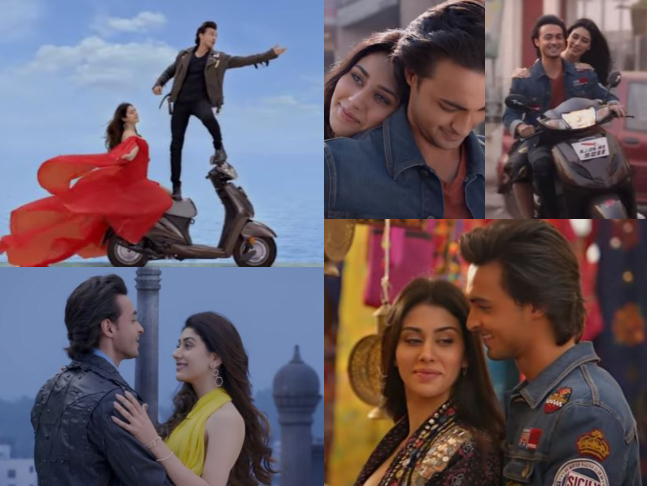 It stars Aayush Sharma, Warina Hussain in its lead roles, Loveyatri was released on 5th October 2018. Sushrut’s (Aayush Sharma) only passion in life is to teach garba to kids in Vadodara, but this time, the 9-day Navratri festival changes his life. He falls head over heels in love Michelle (Warina Hussain) and does everything he can to win her over. This movie was shot in two schedules. Many scenes of the movie were also shot in Vadodara by the Production Team in March 2018. The second half of the movie was starting in April 2018 in London. Ronit Roy and Ram Kapoor both are finalized by the Director in pivotal roles of this movie. The shooting of the movie was completed by the whole Production Team in June 2018. Salman Khan announced about this film in 2017 and, he also Reveals the news via Twitter that this movie has a star that his brother-in-law Aayush Sharma and this movie would be directed by Abhiraj Minawala. Abhiraj Minawala was the Ali Abbas Zafar’s assistant director for Sultan and Tiger Zinda Hai. In February 2018, Salman Khan announced that Warina Hussain would be the opponent leading role for this movie. The film is the Bollywood debut for both Aayush Sharma and Warina Hussain. Loveyatri is a romantic story drama set against the backdrop of Navratri the Nine Days Festival in Gujarat. Aayush Sharma stars as a garba teacher from Vadodara, who falls in love with an NRI lady, that role played by Warina Hussain, when she visits the Vadodara town during the festival. Sushrut’s (Aayush Sharma) only passion in life is to teach garba to kids in Baroda, but this time, the 9-day Navratri festival changes his life. He falls head over heels in love Michelle (Warina Hussain) and does everything he can to win her over. Loveyatri is a romantic story drama set against the backdrop of Navratri the Nine DaysFestival inn Gujarat. Aayush Sharma stars as a garba teacher from Vadodara, who falls in love with an NRI, that role played by Warina Hussain when she visits the town during the festival. Sushrut or ‘Susu’ as he’s fondly called, is written off as an unambitious boy, whose only interest is to dance his life away. He constantly faces pressure from his family to find a ‘real’ job, while he dreams of opening his own garba academy in Vadodara. Over to the United Kingdom; Michelle is at the top of her class, but she wishes to return to her motherland in India. Her father (Ronit Roy) reluctantly agrees; they arrive in Baroda and extend their stay to celebrate Navratri on the insistence of his imposing Gujarati family. During the ‘festival of dance’, Susu falls in love with Michelle at first sight. He becomes the typical lover boy who literally runs in circles, to follow his heart. ‘LoveYatri’ is a straightforward love story – nothing more, nothing less. The makers clearly set out to create a sugary film, so they do that with enthusiasm and tons of nostalgic appeal. Debutant director Abhiraj Minawala plays it safe by sticking to a tried and tested formula, focusing on mushy moments to create drama. The problem is that there are too many sweet nothings in between, and that doesn’t help an unambitious screenplay. The characters are likable, but the story doesn’t make you feel for them because there is the little conflict of note and whatever arises is doused with ease. The songs in the film get special attention for capturing the festivity and mood around garba. Composer Tanishk Bagchi’s renditions of ‘Chogada’ and ‘Dholida’ are energetic with foot-tapping energy guaranteed to be popular on every Navratri playlist. Vaibhavi Merchant’s choreography will inspire plenty to shake a leg as well. The rest of the compositions are catchy enough not to become overbearing as they emerge at the drop of a hat. It’s evident that Aayush Sharma and Warina Hussain are raw, but both have a charming screen presence with enough chemistry. Since the story requires them to be innocent and naïve young lovers, this inexperience works in their favor. Ayush’s boyish appeal is likable, although his first film doesn’t give him a chance to show much range as an actor. Ronit Roy as Michelle’s father and Ram Kapoor as Susu’s uncle, lead the charge to handle the emotionally heavier dialogues and scenes. Although ‘LoveYatri’ lacks the gripping appeal of more contemporary romantic stories, it might be just enough to satiate die-hard romantics looking to revisit the Love Stories of the 90s.